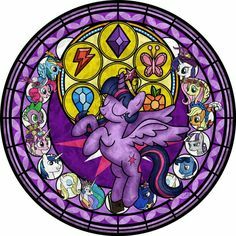 I propose we may be losing Luna and Celestia soon, and Twilight and Cadance will assume their roles, thus completing a cycle of life that the world of Equestria has had for eons. According to all “history” we know of Equestria, Celestia and Luna are “immortal”. Through their teachings, the world molded into one based on cooperation, friendship and understanding. However, during the first few seasons of the show, Twilight is regaled with stories of previous foes Celestia and Luna defeated using the Elements of Harmony together. They defeated all the problems in the entire world whenever they arose, is what we’re given as fact. 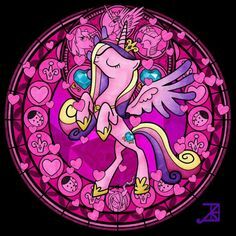 Occasionally we hear of Starswirl the Bearded, but no real evidence save the word of Celestia and Luna who are the only living witnesses of that time. For all we know, Starswirl could be an amalgamation of all those that had bit parts to do during these issues? why did that tradition change suddenly? Why did Celestia take on a student that she pushed, trained, and taught to be a princess, eventually turning into an alicorn and becoming the “Princess of Friendship” ? If ALL the problems of the world had previously been solved with no issue, and Luna was indeed back from her banishment, would there need to be ANY reason she’d need to have a student? ….who went rogue and ran off. She never really talks about what happened, just that she left, and was very upset with Celestia to the point she wanted to return and take the world from her. Keep going now, this gets more interesting. 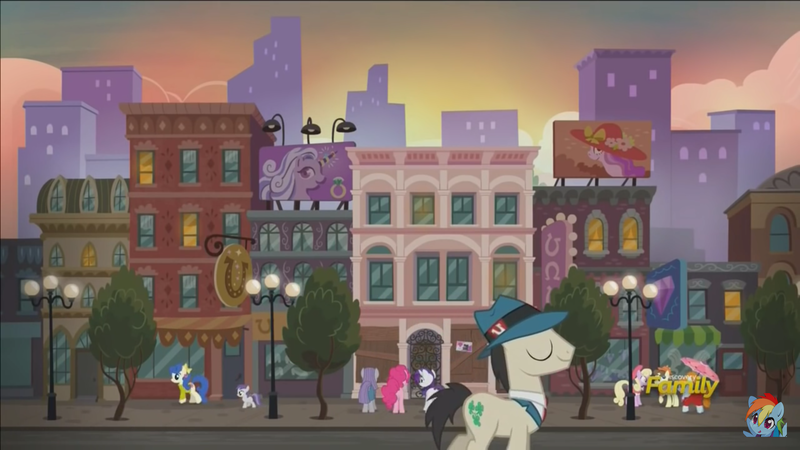 I present as the reason this is all happening is that Celestia and Luna are dying, or need to leave for some reason. She’s training her replacements in both Twilight and Cadance. 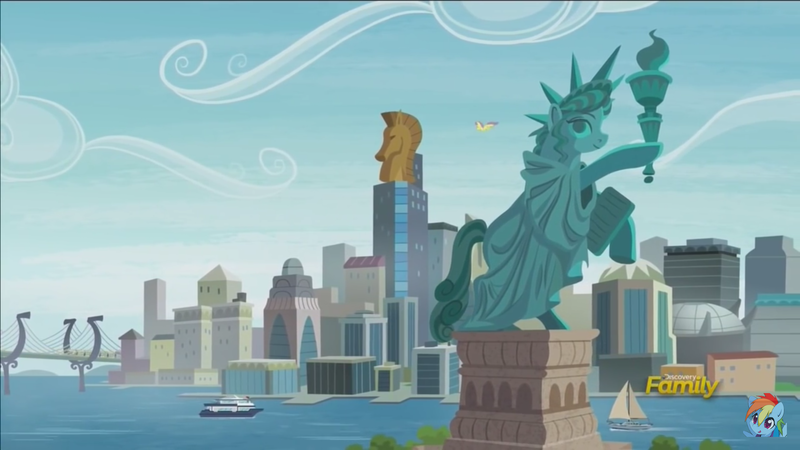 I can postulate a few ideas, but one I’ve always had since around season 3 was that Luna and Celestia are not terrestrial to the world called Equestria. 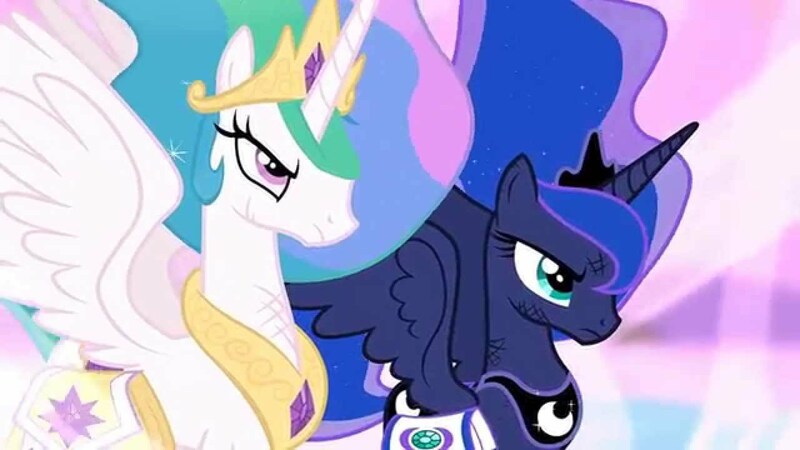 Before anyone goes rolling their eyes, let’s examine this for a minute: both Luna and Celestia have powers no one else does, not even Twilight or Cadance can match these powers. Furthermore, we have never heard them speak of their past as young or growing up together prior to being the rulers. In fact, the history of Equestria given to us by local lore is that there were three bands of ponies that hated each other, and only out of desperation did joining forces prove fruitful. Not once is Celestia or Luna mentioned in these lessons. For being the only two rulers in Equestria… EVER… you’d think they’d have had a footnote in the history that retold every year on Hearth Warming Eve. Perhaps they are merely explorers from the stars that ended up there, trapped, and decided to make the best of it, shaping the world into a utopia the best they could with what tools they had at hand. Perhaps..just perhaps…they inadvertently affected the flow of nature order there and as penance they both decided to stay and watch over the world out of guilt or honor? I put forward the basic idea of the Caretaker in the Star Trek Voyager series. Whatever the reason… TIME… has grown short. That concept in mind I just gave, I propose the reason we’re seeing a sudden change in the way things are (Twilight, Cadance, ect) is that Luna and Celestia are not in fact, immortal. They have very long lifespans compared to others, but still, are in fact, dying. They then know that they have little time before their time in the light passes, and Celestia begins to train replacements for when the time comes they cannot serve in the capacity anymore, rather then let the world die. Perhaps they simply think it’s their duty now, after having shaped the world, that they leave it with some level of similar leadership, leadership and lessons they instill in Twilight and Cadance. No doubt, somehow towards the end, Twilight and Cadance will be given longer lifespans via magic, that in turn finishes off Celestia and Luna. A symbolic, final gesture by the twin gods of the world. two “sisters” who govern the world and have long life spans could easily… easily be turned into two others that do it. Twilight and Cadance would in fact outlive their friends, leaving them to continue on as Luna and Celestia did. In time, as time does, history would forget things, stories would change as they are passed down, seeing as there’s no computer records, in the end, all they have is written word and storytelling. The story, of two “sisters”, who are “immortal” with fantastic powers, who live up to the highest standards of friendship, and expect the world to do just that as well, through their teachings. Teachings that are no doubt bestowed on by various students they both teach. Students that, with each time they teach them, they hope to find what Celestia and Luna found in them: the right person to finally take their place, and let them rest, as did their predecessors. The world would still have it’s two rulers, and all the basic texts would be true if read without question for the most part. No one tends to question the past, or makes a point to reiterate the idea that history is really only written by those that survive it. So we come back to this full circle, that closes, when Princess Twilight and Princess Cadance, the two sisters, find their replacements, and bestow upon them the same gift… or curse… that was given to them. Most, if not all “animated” movies of series are done for the primary reason to tell a story you cannot or would not be able to tell in the span of a regular episode. The 1986 Transformers movie is a good example, as is the G.I. Joe movie of the same decade… both Hasbro I might add. We’ve watched as Twilight has ascended her position as the Princess of Friendship, and now, with the help of her friends, she’s fleshing out and expanding her exposure from the little town of Ponyville to both sides of the Equestrian Map. Learning the lay of the land, and learning of the different cultures, making contacts, fixing problems, exposing her presence to a population that may not entirely be aware of her, but are aware of Celestia. Now that she’s done that, we come to a movie, a movie where no doubt something monumental is supposed to happen, because otherwise, it would have just been another episode. Transformers had the death of Optimus Prime to bring in a new toy line. I propose, as said originally, the My Little Pony Movie… will have the death or departure of Luna and Celestia with Twilight and Cadance taking over their positions, and Starlight and the new characters we’re meeting in this latest season, assuming the roles they had. After mulling this over with various fans in a chat, I seem to have most of them interested in the idea being right, some even feared I was right and told me to stop telling them my idea. Thoughts? Love to hear ’em! 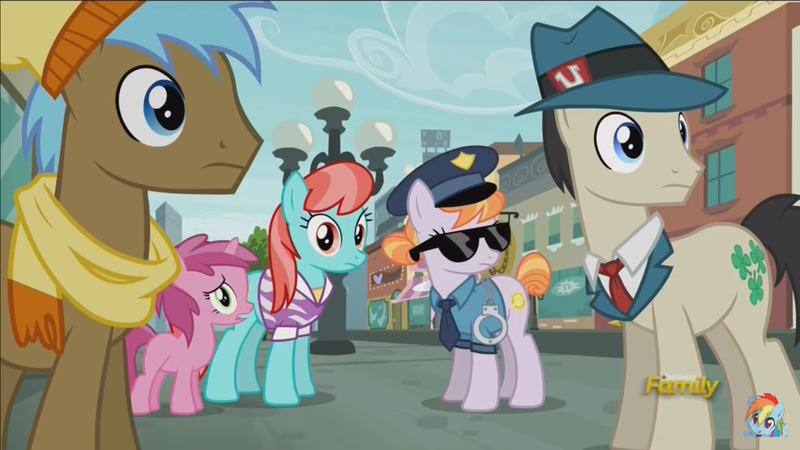 This episode is a quick overall look at the character that’s taken the fandom by storm: Maud Pie. To say anything else is really given in regards to this episode would be a disservice as while it is a fluff piece, it’s one that’s wonderful! Rarity is going back to Manehatten to find a new branch for her ever expanding businesses (Which oddly enough, is what she does in my fiction series Equestrian City, spooky) and Pinkie Pie is traveling with her to have a special day with Maud, who’s there getting her… wait for it… her Rockterite 😛 Bad puns aside, it’s a wonderful little ride with little to no real plot specific points to worry about. This guy with the Shamrocks..is everywhere. WTF? I’m not really upset about this, despite some believing I’m a bit jaded in my analysis, I still enjoy a fun little adventure that doesn’t need a massive cliffhanger or implication. It is after all, supposed to be fun. 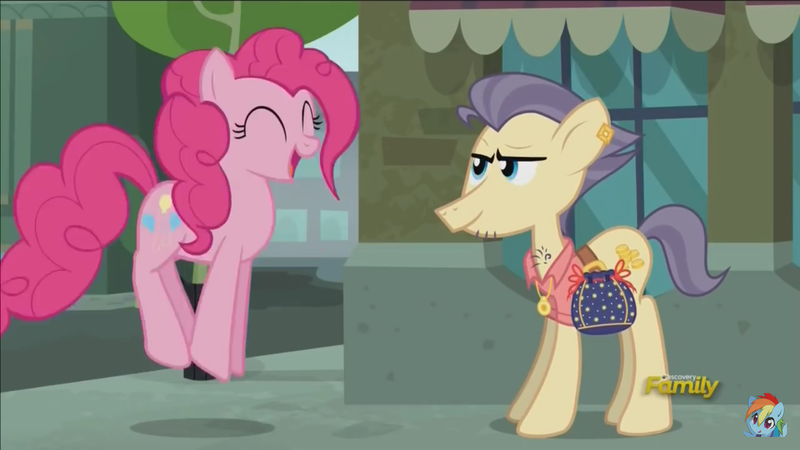 Honestly it looks more like a grown up Sweetie Belle. Incidentally, no one wears horseshoes, yet we use them ALOT. I give this episode a 5 out of 10. The story itself, while classic, has been done before, though it’s much more amusing with our cast I’ll admit. Giving it a “average” is not so much a slap then a nod, as at this juncture, we’ve already established that each episode in recent memory has been excellent. This one maintains that direction. As previously stated, it’s a fun little fluff piece that has little to do with long term plot or story arc, but that doesn’t detract from the fact that..well..it’s a FUN LITTLE FLUFF PIECE! 🙂 Not to mention it’s got Rarity and Pinkie, seldom do we see them together and Maud is just a bonus in this case.